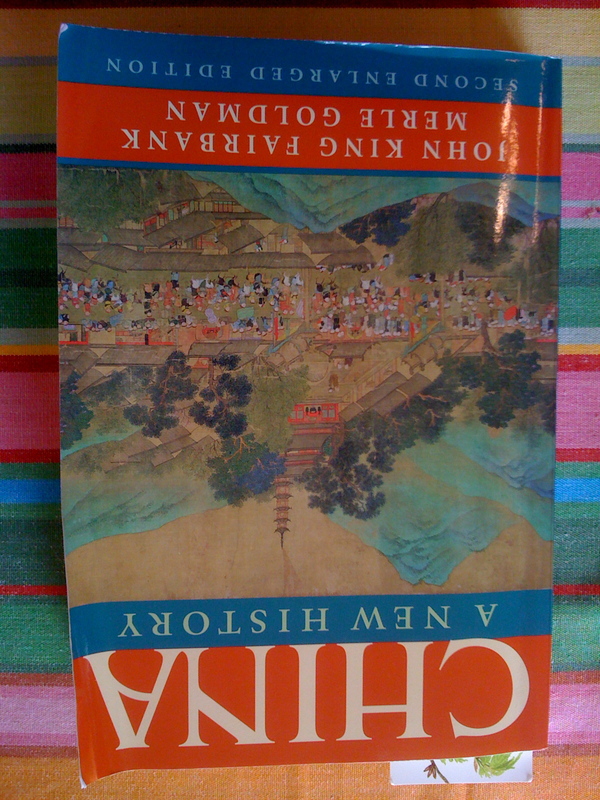 I have finished the #64 (HC, 2007) Fairbanks and Goldman China: A New History! All 500 pages of it…. John King Fairbanks (or JKF as he liked to be called) was one of the premier China watchers of the 60s, 70s and beyond. This history was his last work. He died of a heart attack shortly after finishing it. This is the second edition: Merle Goldman (his student) revised it, adding the last two chapters, which brought it up to date. It is an excellent history. Oddly, if anything, it broke my heart more than the literary portrayals of this history (and I knew the basics of this history)… Maybe because I learned that the Great Leap Forward (into famine and violence) and the Cultural Revolution and so many other of Mao’s bright ideas were really all about political machinations – he feared losing power to some of the other party leaders, so he threw control back to the peasants and 14 year olds. Thus we have an era where illiterate peasants were asked to run hospitals and teach university classes. Where predominantly adolescent and teenage boys and girls were authorized, as Red Guard members, to run havoc over society. Imagine turning China over to the boys of Lord of the Flies and you have the early part of the Cultural Revolution. A time when the violence and terror wrought by unleashed teenagers was horrific. Imagine a country like China where age is revered and holds great authority, where decisions are turned over to mobs of teenagers, who, if anyone (grandparents, teachers, neighbors, brothers, sisters, parents) tried to contain them, could be subject to torture, humiliation and death. All because Mao feared losing power. I’m really glad I made my way through A New History. I enjoyed it and learned a lot. I continue to be struck by how much literature from China and by Chinese how have fled China is about oppression. Part of me is tired of it, can there really be no other story? I recognize that artists who fled may be more focused on oppression than those who stayed, but honestly, I don’t see a difference in the writing of either. Another part of me is interested in why? is oppression such a major theme so that it feels like the only theme. Please note that it is not always the only theme, sometimes love and other stories are the primary theme with oppression a minor theme (like in the exquisite movies “Long Road Home” and “Balzac and the Little Seamstress” that I’ve recently watched) – I guess the striking thing is that it is always there. To some of you this may seem obvious – it is a (decreasingly) authoritarian society within which artists are particularly subject to restriction. Obviously, I understand this, but even so, after reading a bunch of Chinese literature from the past 50-60 years, I’m still struck by how it is the major theme. And this brings me to the question of why? I think one of the answers is that it must have felt (and sometimes feel) so overwhelming, particularly in the early decades. I think, in addition, it was completely discombobulating. Society was sometimes completely turned on its head. Obviously, in addition, part of the goal is to get the word out to the west… Another facet that makes it a bit surprising is that in talking (very frankly and openly) with Chinese friends, I don’t get the sense of constant fear of overstepping bounds… But I also can’t imagine living in a country where criticizing the government in certain ways could result in loss of everything, including life. I’m also reading #71 Beijing Coma (I put the Corpse Walker on hold although it did help me understand the Long Road Home) which is 700 pages long – racing to finish it before I leave. It is big and, I suspect, banned (although my sleuthing suggests it would not be a problem for me to bring it in, why take chances?). Ma Jian was an artist in China who spent time in prison. He has published several books. 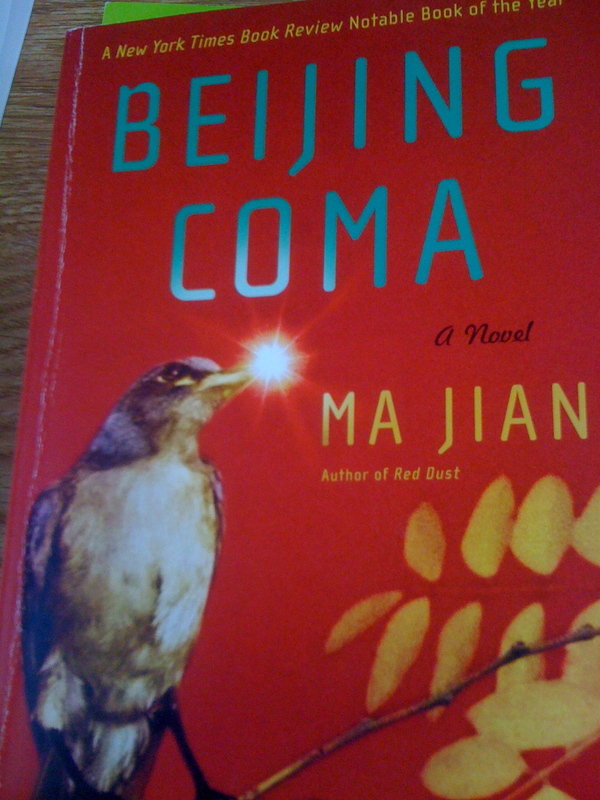 Beijing Coma is a novel about the Tiananmen Square uprisings written from the point of view of one of the lead organizers. I’m enjoying it quite a bit and it is another window into the country. I have been to Tiananmen Square. I know the area a little bit and something about the universities that participated. This is a fascinating story. Maybe you see why I am struck by the focus on oppression… I’ve picked up Chinese literature over the past 5-6 years, probably mostly based on a cool cover. And now as I get around to reading it, I see, again and again, the same themes…. HC = hard copy and I number books by their mention in this blog. My hat is off to you. I do not think I could read five – seven hundred pages about oppression right now. But to also read a handful of heavy books – heavy in every sense…kudos! I certainly think that you have the basis for some interesting conversations once you’re back in China; your impression of themes and how they compare with the impression that your Chinese friends have. Do they see the same theme? Why do they think the themes present are there? I would be interested to know any insights you gain.